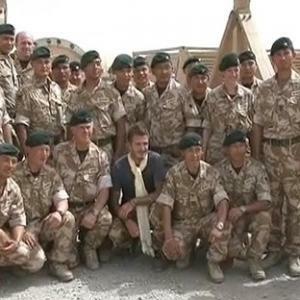 English soccer star David Beckham paid a visit to British troops in Afghanistan. He played some football with a group of Gurkhas and even participated in a prayer with them (notice the Kata scarf around his neck). The kick-around and Buddhist prayer can be seen at the end of this video clip. Beckham is not the only England star that is a fan of the brave Gurkhas. Wayne Rooney has also enlisted a Gurkha to help him out during the World Cup. The gesture of support displayed by football great Beckham to the British troops in action in Afghanistan is exemplary. Interesting to note that he devoted some of his time playing football with a bunch of Gurkhas and even prayed along with them. Celebrity support of this magnitude does a world of good and means a lot to them. Foremost,it uplifts their morale and spirit.Thanks for highlighting the news. Beckham is an absolute gentleman. He impresses me by the day. Beckham is a very great guy. god bless him.